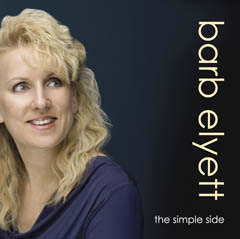 Mike: ...Right now we're going over to Canada to meet a new artist, a Canadian Singer/Songwriter, Barb Elyett! Welcome Barb! Barb: Thank you for having Mike. Mike: Well, I'm guessing but is it Vancouver that you're based? Barb: I'm actually on Vancouver Island which is a ferry ride away from Vancouver. Barb: Ah yes of course! (laughs) I'm actually in a smaller town that's surrounded with a lot of natural beauty: trees, water, mountains. It's actually very beautiful! Nice to speak to you Barb, I'm Tony. Barb, you've been doing this music a long time have you? Barb: Yes, I've been involved in Christian music for quite some time but it's only been in the past few years that I've felt a deeper, more personal call to ministry. That call has led to me to what I'm doing with my music today. Tony: Right, okay...that's a bit of an adventure for you then isn't it! Tony: (laughs) Yes, but as I've observed before, the whole thing about Christian music is that unless you happen to be living in Nashville, there aren't a lot of opportunities to make a lot of money at it. For most people it's a real struggle to make any sense of it financially. Barb: (laughs) Well, I think it really comes down to the artistry, using the gifts that God has given you and ministry. That's what it's about for me. Tony: How would you sum up your ministry? What is it that you're wanting to do with your music? What are you carrying? Barb: For me, the call is really about using my own personal experience through music to encourage, inspire and nurture others to use their God-given talents, overcome adversity and claim the better life that God has for us. Tony: Is that targeted mainly at Christians or non-Christians? Barb: Actually both. I really believe that Christianity is for everybody. I believe that it's not segregated to religions but rather it's open to a wider spectrum of people. I come from an angle that God created each of us and therefore he desires that each of us be his. So, in light of that, some of my music is what could be termed "crossover." I don't necessarily set out to write "crossover" lyrics, I just let a song be what it wants to be and if it turns out that it relates to more people....great! Barb: (laughs) That's a really good point. Years ago I went through the typical situation that a lot of singer/songwriters go through and that is the feeling that you need to move to Nashville...and everything's in Nashville. But I really think that especially in Christian music it's really about getting to the core of what it's all about. Is it about a record deal? Is it about moving to Nashville and possibly getting on with someone that can sell thousands and thousands of your CD's? Yes! Sure! I would love that! But really I think that the essence of all of it is to stay true to the core and heart of the music and the call that God has for you specifically and if that means staying in this country and playing small churches then great! If it means crossing the border and playing worldwide then God's going to make it happen. That's what I believe. Tony: One of the challenges I would imagine in Canada is that the population is so spread out across a very large area that you travel vast distances. Barb: Oh yes, absolutely. It's definitely a lot different than your area right? Things are somewhat closer together there? Tony: We're a bit crammed here and you're very spread out. Barb: Yes, exactly. There is a lot of distance to travel for sure but it all works out. MIke: Okay, let's play the title cut from the album "The Simple Side." What do you want to tell me about this song? Barb: Oh, (laughs) do you have an hour? This song is really about my own journey from "complicated" to "simple." For a long time my life was very complicated, confused and frustrated by various situations from my past. It was emotionally really tough. But God started leading me out of that to a place of simplicity. I didn't know that at my core I was seeking what could be termed "simplicity" but everything just seemed to keep pulling me towards that. When I put the album together, it just, overall, every song on that album was constantly pointing back to the simplicity that is Christ alone. I didn't even know that this was happening when it was happening but when I stood back and took a look at it, it all made sense. God is simple. He, and his ways ARE the simple side - they're simple - not easy, but simple. So this song talks about my journey towards that and how God really is that simplicity that we all really seek. Mike: And it kind of sums up thematically the entire album? Barb: Absolutely, for sure. Yes! Mike: Now are you spelling your name the showbiz way? Is that really how your name is spelled? Barb: (laughs) That's a good question. Elyett is actually derived from my middle name. When I felt God calling me toward my own music ministry, I truly felt that he wanted me to change my name. Hmm,....or....it could have had something to do with the fact that my real last name is difficult to pronounce (laughs). No. I felt that I was suppose to to use my middle name in a greater way now. "Elly" is a form of "Helen" which is my middle name. So that's where the first part of Elyett comes from. And the name "Helen" means "light." The "ett" part of Elyett was added to create a name that would go with Barb. Weeks later after choosing this name I was curious to look up the meaning of the name Eliot. I was shocked to find out that the hebrew meaning of Eliot means "to be called; named." That was definitely a "wow" moment! Mike: And listen Barb, thanks for coming on the program. It's good to talk to you. Barb: Thanks again Mike for having me. MIke: Enjoy the rest of your day. We'll play the title cut - this is "The Simple Side."